We’re thrilled to share the inaugural release of our single vineyard Dry Muscat with you. Aromas of orange blossom, tangerine, and honeysuckle characterize this exciting new addition to our organic wine line-up. 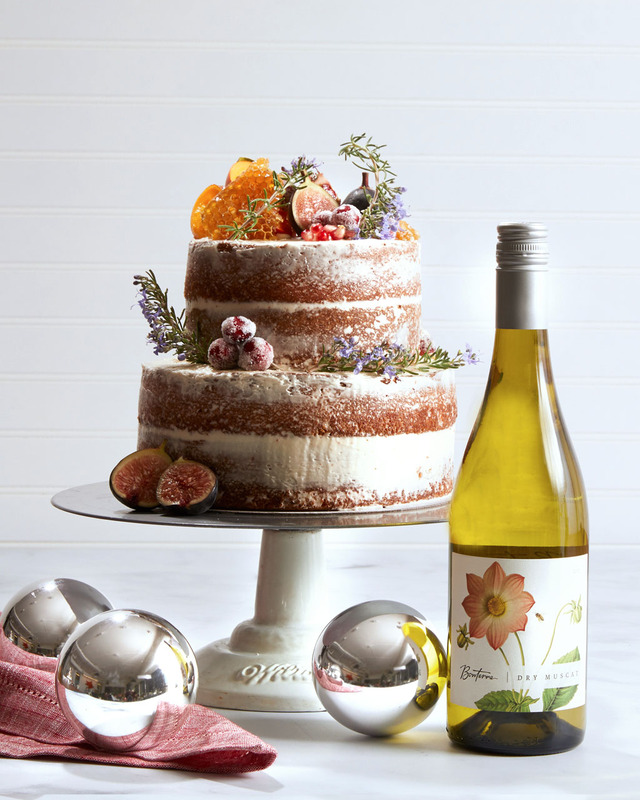 So, inspired by this wine’s aromas and flavor profile, we created the ultimate dessert and dinner party show-stopper – the Naked Orange Blossom Cake with Honey Buttercream. But, before we get to dessert, we suggest serving our Dry Muscat as a refreshing aperitif, or alongside lighter fare such as salads, fresh pasta, or seafood. Get started with our recipe below! Prepare three 9” cake pans by greasing liberally and fitting with a round of parchment paper in the bottom of each pan. Preheat oven to 350°F. In a stand mixer with the paddle attachment, cream together the butter, shortening, sugar, and orange zest until light and fluffy. The sugar should be mostly dissolved and the mixture should look like whipped cream. Beat in the eggs one at a time, scraping down the bowl between additions. Stir together the dry ingredients and add alternately with the milk in three additions. Add the vanilla and orange blossom water and blend well. Divide between the three cake pans, smoothing the top, and bake for approximately 24 minutes or until the cake is golden brown and just springs back when pushed lightly in the center. Allow cakes to cool for 10 minutes then unmold onto a rack to finish cooling completely. While the cakes cool, make the buttercream. Combine water, sugar, and honey in a 4-quart saucepan (the mixture will bubble up). Cook over medium heat to soft ball stage (245°F) use a candy thermometer. While the sugar syrup is cooking, begin whipping the egg whites on medium low speed with the whisk attachment of a standing mixer. The egg whites should be whipped to soft peaks when the sugar syrup is ready – slowly drizzle the soft ball syrup down the side of the bowl while the mixer is running on medium-high speed. Continue whipping until the meringue is thick, glossy, and cooled to warm room temperature. Begin adding the butter in small chunks, until fully incorporated. Beat in the vanilla. Fill and frost the cake with the honey buttercream, then garnish with candied cranberries (recipe follows), candied orange peel, fresh honeycomb, and rosemary sprigs. Whip the egg white with a fork to break up. Use a small brush to brush each cranberry with egg white – you want only a thin layer. Roll the cranberries in the sugar and allow to dry on a rack for several hours or overnight.